Diigo V5.0: Collect, Highlight and Remember! There is a lot to explore in the new Diigo. So make sure you check out our new video overview shown above, install the latest toolbar & Chrome extension, try out our new apps on Android, iPad & iPhone, and of course, delve into the new site. Our new HELP is still under active construction. If you’d like to help, love to hear from you, or come join us in our user forum. Ah, bugs reporting – we’ve tried hard to test through the system as thoroughly as possible. Please do let us know if we have overlooked something. Also, let us know your first impression, likes / dislikes, feedback and suggestion. If you like what you see, make sure to help us spread the word! And of course, last but not least, the entire Diigo team would like to express our most sincere thanks to each and every one of our users and fans, especially those who helped so much in our testing phase, for your time, help, encouragement, suggestions, ideas, and yes, bug reports to help us shape Diigo where it is today. Thank you, Diigo Community, for your continued support to help us make Diigo better and better! Enhanced Diigo Chrome Extension, “Web Highlighter and Bookmark” is out! Check it out here. Users can now highlight webpages with multiple colors and annotate directly on the web (private & group annotations only) as they read online. More Diigo Chrome extension enhancements are forthcoming. Please email us if you experience any problem or have feature requests. Thanks! 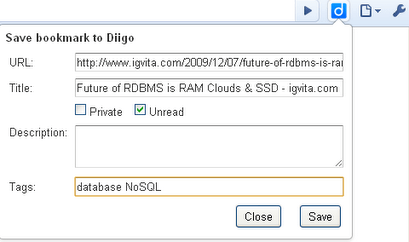 Say hello to our very first Google Chrome extension: “Diigo bookmarks“. 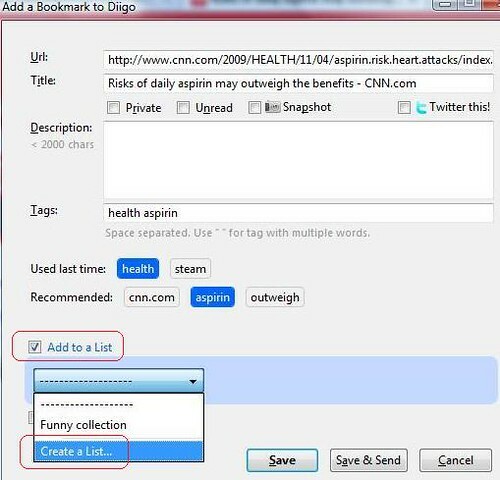 It allows you to save bookmarks to Diigo (& delicious) with simple one-click. When installed, a small d icon will be added to the toolbar (near Location bar). This first release features bookmarking function with simple one-click! 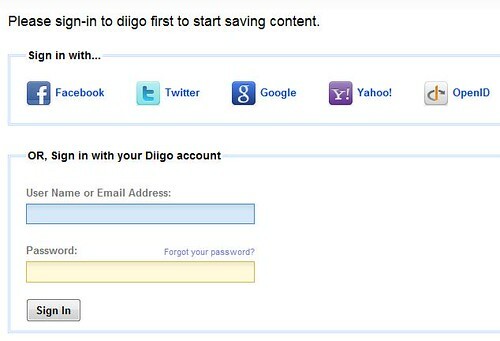 Even if you are not a Diigo user yet, you can start signing in with your Twitter/Facebook/Google/Yahoo/OpenId to get started. PLEASE NOTE: Some of the features you might be familiar with on Diigo aren’t available yet or possible in the current Chrome extension architecture (such as a downloadable toolbar similar to FF or IE add-ons, right-click menu, etc), but we’re working to make it better as we go. We will continue to think outside the box. We will also pay attention to make our Chrome extension(s) fast & really awesome. Stay tuned for new updates soon! PS. We’re so pleased to see so many awesome user comments and know that our team’s hard work is indeed making a difference. Do help us out by giving us good reviews. Thanks for everyone’s enthusiasm and kind support! 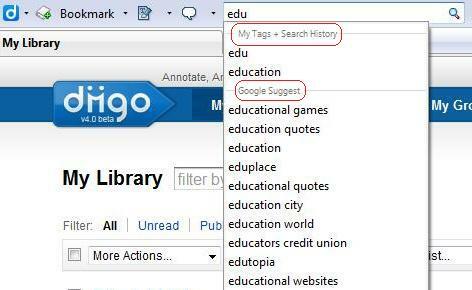 Your search result is displayed in two columns: Google search result on the left, and result from your “My Diigo library” and Diigo community library on the right. Note 2: the “Multi-Category Search & Customized Search Menu” is being disabled in our latest toolbar version (click those 2 links to learn more.) Since currently there are only very few users taking advantage of that particular feature but it’s quite troublesome for us to maintain the ongoing support, we’re re-evaluating to phase it out. As with any software service provider, there are a lot of backend computing considerations and we always have to weight out the pros vs. cons for various features support. 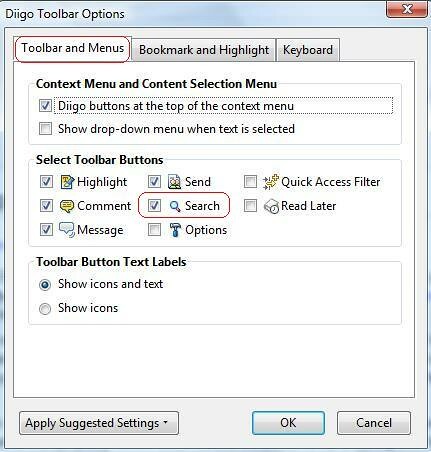 During the evaluation period, for those users who still want to have access to the Customized Search feature, please install this “classic version” instead: http://www.diigo.com/tools?version=firefox_classic Meanwhile, if you feel strongly that we should consider keeping this feature, please email and share with us more feedback on how you use it and ways that you think we can improve it. Thanks! After associating your other credential with your Diigo account, you will be able to login with your Facebook/Twitter/Googl ID/Yahoo ID. 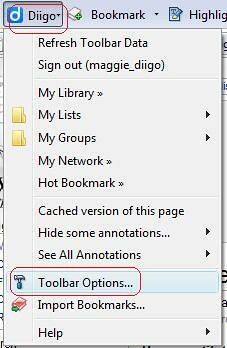 Click the Highlight button on toolbar (without selecting text first). When the highlighter pen is enabled, that Highlight button will become a Highlighter to indicate its status change. You will visually see your mouse becoming a “highlighter pen”. Use the pen to mark up area(s) that you’d like to highlight on a webpage.